From $5,879(1)(2) per person, based on double occupancy & Cat. A: Panorama Suite This category sold out! Airfare to Vietnam not included. Booking deadline is December 31, 2019. Single accommodations may be available; call for rates and availability. No triple/quad accommodations are available. A passport valid for six months past the ending date of this adventure is required. VISAs are required for entry to Vietnam and Cambodia and must be obtained by guest at own expense. $1,000 nontransferable and nonrefundable deposit required at time of booking. Only 7 doubles left on this small-ship adventure. Book soon! Learn More by Attending Our Live Webinar on May 7! 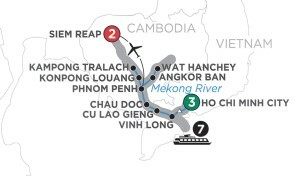 Get the details about Bluegreen’s Life on the Mekong cruise tour by attending our live webinar at 7 p.m. ET Tuesday, May 7. In just about an hour you’ll discover why you should join us on this 2020 Owner Adventure. 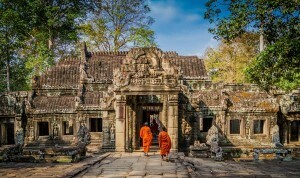 Take a unique and inspiring Southeast Asia land and river cruise tour in Vietnam and Cambodia, getting immersed in the cultures and ancient traditions of the most fascinating places along the mighty Mekong River. Your adventure starts in bustling Ho Chi Minh City with its combination of historic architecture and modern skyscrapers. See its famous landmarks and try your hand at cooking Vietnamese-style. Walk through a section of the Cu Chi Tunnels, an underground tunnel system used extensively as a hideout by the Viet Cong during the Vietnam War. Then embark on your cruise aboard the modern, all-suite Avalon Siem Reap, an Avalon Waterways® ship specifically designed to offer the best river cruise experience on the Mekong. We’ve chartered the whole ship, so only Bluegreen owners and their guests will be onboard. Go ashore by sampan to shop in colorful markets and visit the homes of families that craft sampans and the Vietnamese conical hats called Non la. See traditional floating homes, speedboat merchants and religious sites. 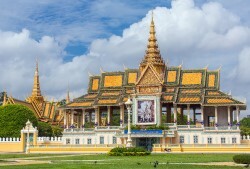 In the capital of Cambodia, Phnom Penh, travel by private cyclo, a traditional three-wheeled bicycle with a driver, to visit the National Museum and the Royal Palace with its striking Silver Pagoda. Learn about the atrocities inflicted on the Cambodian people during a solemn visit to the Tuol Sleng Genocide Museum and one of the Killing Fields. On a hilltop at the site of the 8th-century temple of Wat Hanchey, take in the stunning views before walking through the rural village of Angkor Ban to visit with welcoming schoolchildren. Meet a silversmith in Konpong Louang and ride an ox cart through the beautiful Cambodian countryside. The grand finale of this journey is a 2-night stay in Siem Reap, home to the phenomenal Temples of Angkor architectural ruins. Ride a tuk-tuk (two-wheeled carriages pulled behind a motorbike) to Angkor Wat, the best preserved and most famous of all the temples. See the temples at Angkor Thom, including the splendor of the Bayon temple featuring 200 mysterious faces carved in its many towers, and spend a second day of exploration of the Angkor Temples at Ta Prohm. On your last evening in Cambodia, witness an Aspara dance performance that brings Khmer culture to life, the perfect ending to your remarkable adventure. For U.S. residents only, Travel Protection will be purchased on your behalf by Bluegreen Vacations when you book this Owner Adventure. 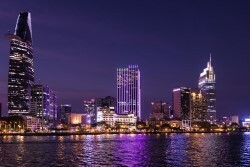 Welcome to Ho Chi Minh City, still known as Saigon to many. You’ll be transferred from the airport to The Reverie Saigon, located on the topmost floors of the landmark Times Square Building in prestigious District 1, the cultural and commercial heart of the city. Rooms will be available for mid-afternoon check-in. The hotel offers four outstanding restaurants and bars to satisfy your longings for the familiar and the exotic. Enjoy the use of an on-site pool and fitness room, or get a pampering treatment in the spa (fee applies for spa services). If you feel like venturing out, The Reverie Saigon is located mere steps from District 1’s most defining destinations, from heritage museums and iconic landmarks to charming cafés and designer boutiques. Overnight in Ho Chi Minh City. After breakfast at the hotel, take a walking tour of Ho Chi Minh City’s historic landmarks. Stop at the Rex Hotel for a refreshing drink at the rooftop bar where the U.S. Military held the infamous “Five O’Clock Follies” during the war. Then visit the War Remnants Museum and bustling Ben Thanh Market. For lunch, participate in a hands-on Vietnamese Cooking Class. Learn to prepare several local dishes and how to recreate them at home. Then sample your delicious creations. Explore the city further during free time this afternoon. This evening join your fellow adventurers for a special Welcome Dinner at a local restaurant. Breakfast, lunch and dinner are included today; overnight in Ho Chi Minh City. Drive out of the city for a guided Cu Chi Tunnels excursion, an extraordinary network of tunnels more than 120 miles in length that were used as a hideout and secret village by the Viet Cong during the Vietnam War. The tunnels were dug with bare hands or simple tools during the French occupation of Vietnam in the 1940s and were further expanded during the Vietnam War in the 1960s. The tunnels were preserved after the war and have been converted into a large war memorial complex. Enjoy free time this afternoon and evening for exploring on your own. Breakfast is included today; overnight in Ho Chi Minh City. You’ll be transferred to the port on the Saigon River for embarkation on your 7-night cruise aboard the Avalon Siem Reap, a ship designed to offer the best river cruise experience on the Mekong. The ship has been meticulously crafted to offer all the modern features you expect, yet it retains the colonial charm of Vietnam and Cambodia. While the number of guests may be small (just 36 total), the ship isn’t. Built as long and wide as other ships that carry twice as many guests, the public spaces never feel congested. Panorama Suites have 14-foot wall-to-wall windows that open to create a large Open-Air Balcony®. Get acquainted with the ship and relax before your Welcome Reception this evening as you sail to Vinh Long. After dinner attend a special musical performance featuring traditional Vietnamese instruments. Breakfast at the hotel; lunch and dinner aboard ship; overnight aboard ship. Board a sampan this morning for a local workshop in Vinh Long to see how rice paper, rice wine and traditional candies are made. This afternoon enjoy scenes of daily life on Cu Lao Gieng Island via sampan and local motor cart. Your guided excursion starts at a local workshop, where a skilled family handcrafts sampan boats. Then visit the home of a local family that makes Vietnamese conical hats, or Non la, from materials such as palm leaves and bamboo. These iconic hats are primarily used as protection from the sun and rain, but they are also used as a basket to carry goods home from the market. Your last stop is at one of Vietnam’s oldest Catholic churches. Breakfast, lunch and dinner aboard ship; overnight aboard ship. In Chau Doc take a guided walk through the local market and absorb the atmosphere as locals are busy buying and selling fish, meat and produce. Then embark on a river excursion down the backwaters of the Mekong. Along the way, see traditional floating homes, speedboat merchants, religious sites, a market selling dried goods and more. After lunch a sampan brings you to the village of Long Khanh A for a cotton-weaving demonstration, a well-preserved artisan’s tradition. Return to the ship and cross the Cambodian border this evening. Breakfast, lunch and dinner aboard ship; overnight aboard ship. Bonjour! French charm lives in Cambodia’s capital city. Take a city tour by private cyclo, a traditional three-wheeled bicycle with a driver that is a popular form of transport throughout Southeast Asia. Visit the Royal Palace with the spectacular Silver Pagoda and the National Museum featuring an outstanding display of Khmer artifacts. This afternoon you’ll have an included Kingdom Brewery Tour. After the tour, sample several different beers in the tasting room. Just before dinner, children from a local orphanage will perform a show featuring local songs and dances. Breakfast, lunch and dinner aboard ship; overnight aboard ship. This morning a guided visit to the Tuol Sleng Genocide Museum and one of the Killing Fields offers a glimpse into the atrocities inflicted on the Cambodian people by the Khmer Rouge regime from 1975-79, immediately after the end of the Cambodian Civil War. After lunch the ship will depart Phnom Penh for Wat Hanchey. Breakfast, lunch and dinner are included today; overnight aboard ship. Visit Wat Hanchey, a hilltop temple dating back to the 8th century. Climb or take a drive to the top, where you will have stunning views of the surrounding area and partake in a traditional water blessing given by local monks. After lunch take a walking tour through the rural village of Angkor Ban. Here you will visit a traditional Khmer house and interact with children at a local school. The ship sets sail this evening. Breakfast, lunch and dinner aboard ship; overnight aboard ship. Start your guided sightseeing at the silversmith village in Konpong Louang. See talented craftsmen use age-old techniques to turn pure silver into works of art. In Kampong Tralach board an ox cart for a ride through the beautiful Cambodian countryside. Stop to meet a local farmer and learn about his daily life. This afternoon enjoy scenic cruising on the Tonle River before heading back to Phnom Penh this evening. Breakfast, lunch and dinner aboard ship; overnight aboard ship. This morning you’ll be transferred to the airport for your included flight to Siem Reap, home to the Temples of Angkor, considered by many to be the most spectacular architectural ruins on Earth. Angkor was the capital city of the Khmer Empire and flourished from the 9th to 15th centuries. Situated amid dense rainforest and rice paddies, many of the temples have been restored and welcome more than 2 million visitors each year. After lunch begin your Temples of Angkor excursion tour by tuk-tuk (two-wheeled carriages pulled behind a motorbike). Start your exploration at the best preserved and most famous of all, Angkor Wat. Originally constructed as a Hindu temple dedicated to the god Vishnu for the Khmer Empire, it was gradually transformed into a Buddhist temple towards the end of the 12th century. With its five trademark towers, it is the symbol of Cambodia. Then visit Angkor Thom, where you will explore Bayon Temple with its 200 striking faces carved in 54 towers and impressive bas-relief sculptures. Or you can choose to visit Angkor Wat, Angkor Thom and Bayon Temple by bike. Stay tonight at the Park Hyatt Siem Reap, located in the heart of the city. This award-winning hotel blends an elegant and contemporary design to create an enlivening resort and residential feel. Stylish guestrooms offer all the amenities one would expect at a deluxe hotel. Relax by one of the two pools or in the inviting Living Room lounge and bar, work out in the fitness center or visit The Spa for holistic therapies and treatments using only locally harvested floral and aromatic ingredients (fee for spa services). Breakfast aboard ship; lunch on excursion; overnight in Siem Reap. Continue your guided sightseeing of the Angkor Temples at Ta Prohm. Tree roots cover the ruin walls, allowing you to experience the temple with the same wonder as the early explorers. Then visit Banteay Srei, a unique temple built on a small scale from red sandstone, which can be carved like wood. En route stop at a local village famous for making Khmer noodles by hand. Spend the afternoon at your leisure or further explore the temple complex on your own. This evening a private Apsara Dance Performance brings ancient Khmer culture to life through music, song and dance. Breakfast and dinner are included today; overnight in Siem Reap. Your adventure ends with breakfast and transfer to the airport. Call 800.459.1597 to Book Your Life on the Mekong River Adventure Today! *TRAVELER PLUS POINTS-FOR-TRAVEL BENEFIT TERMS & CONDITIONS: In order to apply any combination of annual, biennial, borrowed or rented Bluegreen Vacations Points for payment, Owner Adventure price, including base fare and taxes, must be a minimum of $500 per person for the first and second travelers in a room or cruise cabin, for a total minimum fare of $1,000. Benefit applies only to active Traveler Plus members. Prices are shown in U.S. dollars. Prices are per person and based on double occupancy. Avalon Waterways cruise tour inclusions are hotel accommodations in Ho Chi Minh City, Vietnam, and Siem Reap, Cambodia; some meals on land portion of vacation; on-tour motorcoach transportation; 7-night Bluegreen-chartered Mekong River cruise aboard the Avalon Siem Reap; all meals aboard ship; guided sightseeing as outlined in itinerary; excursion to Kingdom Brewery in Phnom Pehn, Cambodia; admission to attractions; and hotel luggage handling. The following charges are not included in the land/cruise vacation price, unless otherwise noted: airfare to and from the start of your vacation; intra-vacation air, unless specified in the itinerary; airline baggage fees including checked and/or excess baggage fees; Federal inspection fees for the Federal U.S. Customs and Immigrations; International Air Transportation tax; agricultural tax; other per person taxes imposed by government entities; airport taxes and fees, including the September 11th Security fee up to $11.20 per person, passenger facility charges up to $18 per person, Federal domestic flight segment fees up to $4.00 per segment, and U.S. and international arrival and departure and other government-imposed added by the airline and applicable at time of booking; port taxes; passports; visas and vaccinations; laundry; telephone; minibar; alcohol, beverages, and food outside of the contracted Avalon Waterways menu as presented at a hotel or restaurant or onboard your vessel (these extra items will be billed to you before leaving the hotel, ship, or restaurant); airport transfers on non-qualifying flights; optional excursions; porterage at airports and train stations; vacation insurance; and all other items of a personal nature. Price is per person based on double occupancy. Owner Adventure package includes Avalon Waterways cruise tour inclusions noted above plus these additional inclusions: excursion to Kingdom Brewery in Phnom Pehn, Cambodia; on-tour economy-class flight from Phnom Pehn, Cambodia, to Siem Reap, Cambodia (one-way); airport transfers in Ho Chi Minh City, Vietnam, on December 7, and Siem Reap, Cambodia, on December 19; gratuities for tour manager, local guides and driver; and government taxes and fees. Travel Protection will be purchased on guest’s behalf for U.S. residents only by Bluegreen Vacations. A passport valid for six months past the ending date of this adventure is required. VISAs are required for entry to Vietnam and Cambodia and must be obtained by guest at own expense. Guest is responsible for applying for and obtaining required entry VISAs in advance of the commencement of travel. Reservations must be booked by December 31, 2019. Nonrefundable, non-transferrable deposit of $1,000 per person is due at time of booking. Final payment due by May 29, 2020. Prices, additional fees, itineraries and availability are subject to change without notice. Certain terms, conditions, and restrictions may apply. Please call us at 800.459.1597 for additional information. Fares shown are in U.S. dollars for new reservations only and are subject to availability. Not included: international airfare; airline baggage fees; airport or departure taxes; vacation insurance for non-U.S. residents; Vietnam and Cambodia visas; gratuities for hotel housekeepers; food outside the contracted Avalon Waterways menu as presented at a restaurant for included meals; optional excursions; and all other items of a personal nature. Great Vacation Destinations, Inc doing business as Bluegreen Travel Services, is located at 4960 Conference Way North Suite 100, Boca Raton, FL 33431. Great Vacation Destinations is an Iowa Seller of Travel No. 688, Washington Seller of Travel No. 602-283-711; Florida Airlines Reporting Corporation (ARC) registration No. 15-72225-4, California Seller of travel registration No. 2068362 (Registration as a Seller of Travel does not constitute approval by the State of California). Void where prohibited by law and where registration and/or licensing requirements have not been meet. In the event of a conflict between Avalon Waterways’ Details of Participation and Great Vacation Destinations’ Details of Participation, Avalon Waterways’ Details of Participation shall govern.